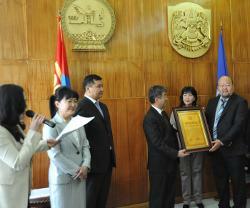 Director of Projects Abroad Mongolia, Oko Togtuun was proud to collect an award for Best NGO working with children in Ulaanbaatar last month. 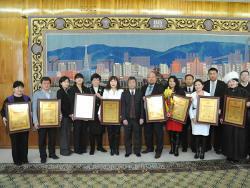 Every year the Ulaanbaatar City Municipal Office presents awards to schools, kindergartens, NGOs and government organizations to show appreciation of their outstanding work with underprivileged children. Projects Abroad’s teaching and care projects in Mongolia have been focusing on arranging a wide variety of activities for orphans and street children for many years and it is fantastic to get this award as recognition of all the hard work.